Not everyone likes beets. However, they have amazing health benefits. Beets are high in many vitamins and minerals. They help cleanse the body and are a high source of energy. Often dislike comes from childhood. I know because I was forced to eat borscht. This is a beet soup made by Europeans. Trust me, it is an acquired taste. Growing up we had to have it at least once a month. I didn’t like beets until I was in my 30’s when I learned about the benefits and started growing them in my organic garden. Now, I eat the greens and roots weekly. One of the ways I prepare beets is in smoothies. 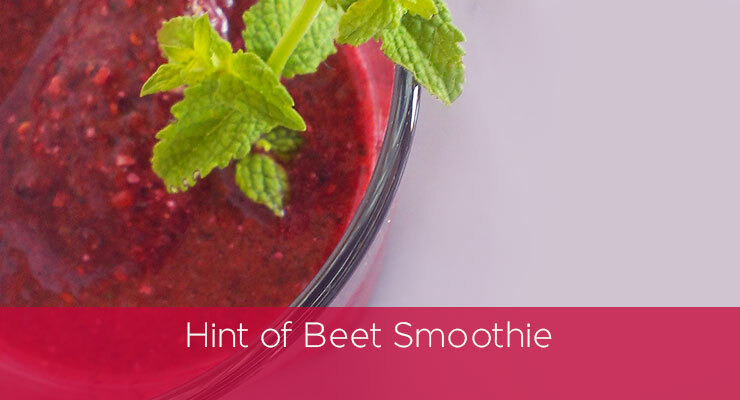 I created the following recipe using a small beet. It is an ideal way to introduce beets into your diet. To truly receive the health benefits you would need to eat more than this recipe suggests. Place all ingredients into a mixer container in the order listed and secure the lid. Blend for 30-45 seconds until the right consistency.